Double click on the videos to go full screen! 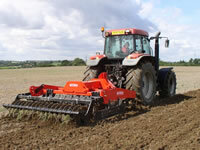 The Quivogne Pluton has been designed and built to meet the needs of the small horsepower market that wish to minimise their establishment costs whilst maximising their output. 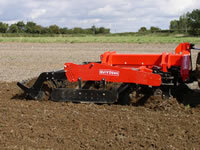 The Pluto has been developed to become an effective one-pass establishment cultivator that subsoils, aerates, cultivates and presses in one simple action, this is achieved by having four clear stages - 1 Tines, 2 Discs, 3 Harrow, 4 Press - whilst at the same time being built in a compact mono frame design. 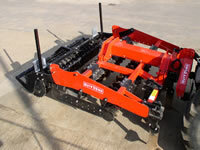 Performance can be further enhanced with the addition of aftermarket mounted seeder units that operate in unity with the Pluto to further consolidate establishment costs. 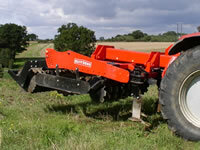 The depth of the tines are fully adjustable and can be set up to a maximum of 350mm working depth. The design of the 'foot' is such that the 'tip' is angled slightly to penetrate the ground, which then causes the 'wings' of the 'feet' to lift and crack the soil that creates the desired drainage. 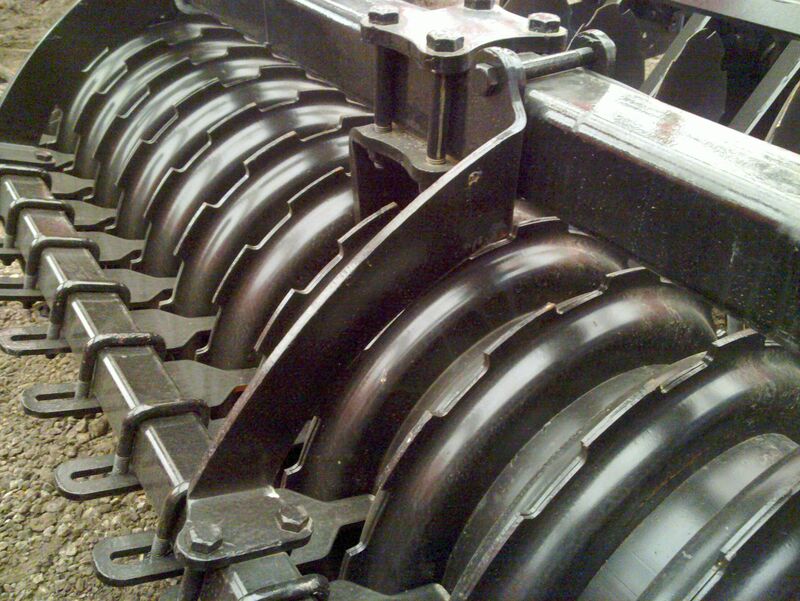 The 'legs' are designed to stay above the ground and so do not wear and are fitted with shear bolt protection. Tungsten hard faced parts are available to further reduce wearing costs and also to reduce downtime. The discs are individually suspended on rubber mountings to allow for a shock absorber effect. 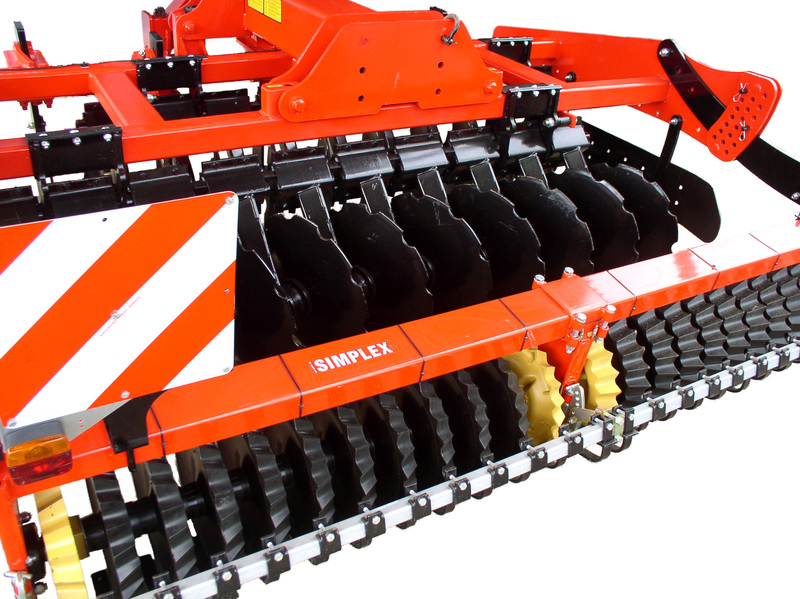 The concave serrated discs are 560mm diameter to allow for a fast revolution therefore creating the desired cultivation and mix. 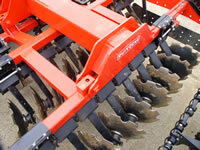 The discs are arranged in two opposing rows with a staggered overlap to make sure all the ground is cultivated whilst leaving a level finish for the press stage. The Pluton has the option of 3 different presses to best suit individual needs. 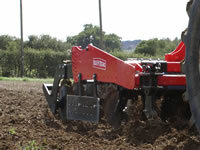 Option1 is Quivogne’s Rollcrest system which is an efficient, reliable yet cost effective press. 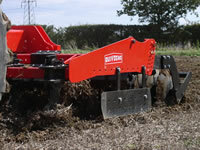 The Rollcrest has a sharp profile, designed to slice and press clods and is 660mm Ø with a notched leading edge enabling a constant ‘drive’ for the press. The individual rings are joined together by locating lugs resulting in the whole gang of rings to turn and drive as one in all conditions. Option 2 is the RollPro which features a more pronounced shoulder to produce a firmer pressed finish. 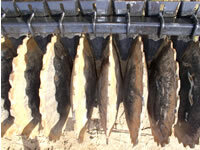 The rings are 660mm Ø, sit on a 40mm square shaft and feature a notched leading edge giving the press constant ‘drive’. Option 3 is the lightweight Guttler synthetic press which produces a weatherproofed finish whilst saving 500kg at the rear. All of the presses are adjustable by the use of a pin and hole system which works in conjunction with the working depth of the discs. 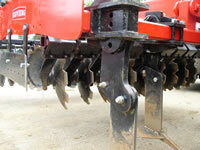 Adjustable row of basic levelling tines designed to level and cover over autocast seed.